In his introduction Fisher describes the economic decline of Youngstown, Ohio, where he spent his early years. Thriving in the 1950s as an industrial sup-plier of steel to the many American industries needing it, he traces the rise of more efficient producers abroad in lower-wage countries and the closing, one by one, of the Youngstown mills because of competitive pressure. This decline in employment, with its accompanying racial troubles, population decline, crime, poverty, and boarding up of housing, was paralleled by the growth of an emergency food sector of food banks, pantries, soup kitchens, and other efforts to prevent widespread hunger. Yet, he argues, the crisis of off-shoring jobs that led to Youngstown’s decline has long passed. Why is the Second Harvest Food Bank of the Mahoning Valley, for instance, still serving almost 8,000,000 meals per year? Food charity, he believes, is now just a band-aid on a gaping wound. It’s perpetuation by those who now have a vested interest in continuing it only obscures the need for real changes – jobs that can sup-port a family without resorting to food aid. Reading it I was acutely conscious that many farm workers and some owners on organic farms are in fact also eligible for emergency food. Those programs may help to make possible lower wages on farms as much as at Walmart or your local fast food chain. The arguments of the book are arrayed in 8 chapters and a conclusion. Chapter One explores the meaning of the word “hunger” as a social construct by examining such things as Project Bread’s Boston Walk for Hunger which raises up to $4,000,000 through the participation of 30,000 to 40,000 walkers. Although “food insecurity” is probably a more accurate term for typical American food deprivation (missing an occasional meal, relying on cheap filling foods, reducing food quantity, and being anxious about future meals), advocates fiercely defend the term hunger because they feel it has emotive power. Religious traditions of feeding the hungry as being godly work reinforce this charitable approach. Chapter Two focuses on the emergency food system as a whole, including the damage it does to individuals and society, and begins envisioning how to re-form it. This also takes a Boston example, this time the Greater Boston Food Bank (GBFB) and its 54 million pound food distribution service. Fisher points out that there is no academic home for charitable food, the way there is for public health or social work, which means there is no organized ques-tioning or analysis of such institutions as GBFB and the work they do. He explores the history of charitable food going back 400 years, with an emphasis on the 1967 origins of food banking in Phoenix by John van Hengel. Moved by a documentary on hunger in Africa, van Hengel began asking grocery stores for unused edible items and distributed them to low income people. The idea grew and within 10 years Second Harvest, a national organization, was formed to coordinate and guide development of food banks, of which there were 13 in 1979 and 180 ten years later. Fisher’s problem with food banks and the pantries and soup kitchens which distribute the food rests partly with the inherent way people feel using them – stigmatized, pitied, powerless – and partly with the mismatch between the chronic nature of the need and the crisis design of the service. We need to design a response to the real need, he suggests – which is not to get over a crisis like a flood or hurricane, but that people are poorly nourished because their incomes are low and high quality healthy food is expensive. The solution he sketches involves such simple things as stopping measuring success in terms of meals provided or pounds dis-tributed, and as difficult as organizational involvement in social and labor justice campaigns, and refusing donations of food which is of poor quality, un-healthy, or would undercut the dignity of the recipients. Chapter Three looks at corporate giving to anti-hunger causes and the ways such philanthropy has evolved. From an earlier stance that all profits belong to the shareholders and management has no right to give them away, most corporations have now evolved charitable programs as separate arms of the firm and focus them on ways to give which enhance the business, either directly or through some sort of “halo effect”. He cites a case study of the Walmart Foundation which found that many of the retailer’s donations were tied with efforts to secure good publicity in areas where they have had difficulty in gaining acceptance for a big box store. Chapter Four delves into the question of excluding sugar-sweetened beverages (SSB) as eligible purchases under the federal Supplemental Nutrition Assis-tance Program (SNAP). Suffice it to say that nutritionists almost to a person have decried the widespread sale of SSBs in this country, and have linked them to high diabetes rates and a host of other public health problems. But, ask the anti-hunger groups, should we tell the poor what they can eat? Is that not the height of paternalism? They contend, with some evidence, that SNAP recipients don’t make any poorer selections than the rest of us. If we want to deal with diabetes, obesity, and SSBs, they say, we have to look to the larger American diet. Studies have been done comparing the SNAP population’s diet with that of other non-SNAP poor people, but the results are not conclusive. Chapter Five deals with how the $100 billion+ in annual federal food program expenses might support a broader and more democratic array of producers, retailers and processors than the Big Food and Big Ag companies it currently rewards. The arguments for smaller and more local providers are all too familiar to most readers of this journal. Chapter Six examines how and why the issue of higher wages has not been on the agenda of the anti-hunger movement, and how income inequality would take center stage if the poor were fairly represented at the table. There is very little overlap between the nutrition programs and labor unions, for exam-ple, which tend to see those programs as necessary social services but irrelevant to the struggle of working people to achieve an adequate living. Obviously the presence of corporate philanthropists from the food sector also colors the willingness of nutrition program advocates to bring up the issue of wage lev-els in that sector. Chapters Seven and Eight provide models within and outside the anti-hunger movement of organizations which go beyond simply feeding programs and are moving into what Fisher calls holistic work beyond simple charity. Some are building alliances with labor, some are implementing innovative pro-gramming in the areas of public policy, farming and gardening, race and class awareness, food access, economic development, etc. Others are working beyond food programs altogether and, like the Coalition of Immokalee Workers or OUR Walmart, pressuring major companies to improve worker living standards so that employees don’t need emergency food or federal food assistance. 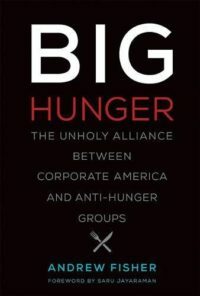 In his conclusion Fisher reiterates his criticism of anti-hunger work – that it is based on a charity model – which avoids the hard work necessary to change the underlying dynamic of poverty wages and ends up putting many of the federal tax dollars spent on hunger back into the bank accounts of Big Ag and Big Food.